Application areas include rock drilling, rock cutting, crushing and screening, loading and hauling, tunneling, quarrying and breaking and demolition. In 2015, sales were approximately Skr33bn with about 15,000 employees in continuing operations. 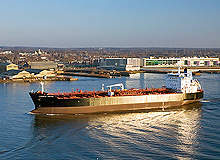 Extensive research and development goes into every product provided by the company and comes with application expertise. A worldwide service network means that customers receive on-site service, training and round-the-clock support. Sandvik Mining’s automation solutions improve staff working conditions and safety. The systems also increase production output, as a fleet can be used for longer, with lower maintenance costs because of higher tramming speeds. Sandvik’s AutoMine® Product Family is a comprehensive offering, which includes single equipment automation, fleet automation, process management, including manual production, and equipment monitoring. The innovative automation systems reduce the number of operators required and increase the number of machines they can monitor. Whether using single equipment or fleet automation, Sandvik’s AutoMine allows operators to sit in a safe, air-conditioned control room on the mine surface and monitor the movements of driverless loaders or trucks that are hundreds of metres underground. It can also be used for controlling drill rigs on the surface. Supervisors in the control room can communicate with colleagues, monitor processes and control both surface and underground operations. Sandvik Mining’s hard-materials technology is renowned for its quality, performance and value. The company’s equipment raises productivity by enabling operations to economically excavate even extremely hard rocks and materials. Sandvik rock drilling equipment is renowned for quality, reliability and high productivity. Every Sandvik machine is designed to give the lowest possible cost per metre drilled and lifecycle cost. Sandvik Mining offers a wide choice of machines, ranging from simple yet robust drill rigs, to semi-automated units that give substantial production rates. Underground loaders and haul trucks need to be reliable. Sandvik Mining loaders and trucks are available in very large capacities, which remain manoeuvrable and productive under heavy use. The robustness of the machinery increases production at a low cost per tonne. Sandvik Mining produces both machines and the mechanical cutting equipment customers require, to guarantee an effective end-product, optimum productivity and a long service life. Customers can choose products, parts and technology, and be assured that they will work together seamlessly. Sandvik Mining Systems delivers surface and underground mining technology to clients worldwide, even in extreme climate conditions. From planning stages, to purchase, operation and maintenance, Sandvik Mining has a service package to suit all customers, for a life-long relationship. Advisory Services – Training programs, performance assessments and investigative and modelling services. Barminco, Hindustan Zinc, Petra Diamonds and Vedanta Zinc International tap into the Sandvik and IBM relationship to improve operations and safety in underground hard-rock mining. OptiMine® is a modular information management solution that offers a real-time view of your underground mining operations. The new Sandvik RH460 hammer takes DTH drilling to higher levels. It has been developed for superior productivity in variable ground conditions. The Borden gold project (formerly Borden Lake Project) is located in Chapleau, Ontario, Canada. The Sekisovskoye mine is located in the village of Sekisovka, approximately 40km from Oskemen, the east regional capital of Kazakhstan, and is an underground mine with gold and silver ore bodies. Continuing the development of the Australasian market, Sandvik Mining and Rock Technology is proud to announce the extension of the agreement with Porter Group to cover Australia and New Zealand. Sandvik Load and Haul has developed a Proximity Detection System Interface for its underground loaders and dump trucks. Easy to learn, operate and service, the xSeries offers a migration path to the iSeries should the customers business needs dictate. Sandvik acquires privately owned Artisan Vehicle Systems, a manufacturer of battery-powered underground mining equipment, based in Camarillo, California, US. A major contract has been secured by Sandvik Mining and Rock Technology with Sibirskaja Ugolnaja Energetitscheskaja Kompanija (SUEK) for the supply of 12 mechanical cutting machines for various mines located in Siberia, Russia. Sandvik is continuing to develop battery electric solutions for mining operations, in order to meet the growing needs of the mining industry’s electrification requirements. Last week, more than 200 leaders in the Latin American mining industry met in Santiago, Chile for Digitalization in Mining – Through the Rock. Continuing its focus on IoT solutions for the mining industry, Sandvik has signed an agreement with Nokia to further develop Sandvik solutions for private LTE (Long Term Evolution) and 5G technology. In recent years, self-driving vehicles have become a popular discussion topic. Sandvik has had automated loaders and trucks working in mines for more than 20 years - with zero accidents involving people. To prove its capabilities, Sandvik moved things above ground and put its latest generation of automation to the test. Sandvik Mining and Rock Technology expands its high-pressure DTH drill rig offering with a new model, Leopard™ DI650i, designed for larger hole sizes. Sandvik solution for optimizing truckloads, the Integrated Weighing System (IWS), supports productivity by offering accurate real-time payload data for load and haul equipment operators. Using the IWS ensures full utilization of the truck’s payload capacity, every cycle. Introducing the new intelligent loader, Sandvik LH517i, Sandvik strengthens its fast-growing i-product range. Sandvik acquires privately owned Inrock, a leading supplier of rock drilling tools and services for horizontal directional drilling (HDD) in North America. Sandvik introduces the new RR441 rotary bit with an advanced cutting structure design. Sandvik Mining and Rock Technology has signed a strategic framework agreement with Resolute Mining to fully automate the company’s large-scale Syama gold mine in Mali, Africa. Sandvik Mining and Rock Technology continues its long tradition of developing innovative technology to help our customers improve productivity, reduce cost & enhance safety. Our recent product development efforts translate this tradition into tangible results for our customers. The World Tunnel Congress 2018 is taking place in Dubai, UAE, from 22 to 26 April. An increasing workload has seen KB Contracting & Quarries New Zealand expand and upgrade the equipment in its operations, recently buying a new Sandvik crusher and screen, a Hyundai loader and a Bomag roller from Porters in Christchurch. Sandvik is introducing AutoMine™ Tele-Remote for underground loaders, a new smart entry-level addition to its industry-leading AutoMine product family. Combining more than three decades of mechanised cable bolting engineering, the cutting-edge Sandvik DS422i cable bolter is designed to enable better process control through assistive and automatic technologies and connectivity. Sandvik is introducing new intelligent mining trucks for automated haulage, delivering tangible benefits in safety, productivity and profitability. Paired with AutoMine® Trucking, mines can increase haulage production by as much as 30%. Hecla's Greens Creek is the first US underground mine utilizing automated loading technology from Sandvik. The major step will enable increased productivity, improved safety and better cost control, while bringing digitalization of the mining process closer and increasing operational transparency. Solving a problem a customer experienced when drilling in abrasive rock conditions has led to a groundbreaking new design for drill bits. The resulting Sandvik top centre drill bits, which incorporate the largest upgrade to face drilling bits in decades, are now available as standard products in three sizes. Primary applications for the top centre drill bits include face drilling and bolting in both mining and tunneling environments, where long bit life is essential in cutting costs and improving productivity. Sandvik continues its successful development of equipment for longwall mining with the launch of its next generation Sandvik MB670-one bolter miner. The new Sandvik MB670-1 increases productivity, reduces total cost of ownership and improves safety andergonomics for operators. The Sandvik MC350 continuous miner for mid-size room and pillar applications is the latest edition in the comprehensive offering of continuous miners from Sandvik. The new and innovative hybrid tools from Sandvik Mining are the industry's most versatile cutting tool, providing both smooth cutting efficiency and durability in conditions ranging from soft rock to the harshest of environments. Sandvik information management solutions, including equipment monitoring and production management, offer a real-time view of the underground mining operation. Sandvik Mining is setting the industry standard with advanced automation solutions that significantly increase productivity and safety, as well as lower the total cost of ownership. Sandvik Mining has proudly commissioned a new high-load, hard rock-cutting test rig as part of its continued investment in research and technology and commitment to hard rock mechanical cutting. Sandvik DR461i is a diesel-powered, self-propelled, crawler-mounted blasthole drill that is automation-ready and features forward-thinking design and technology for bulk mining operations. 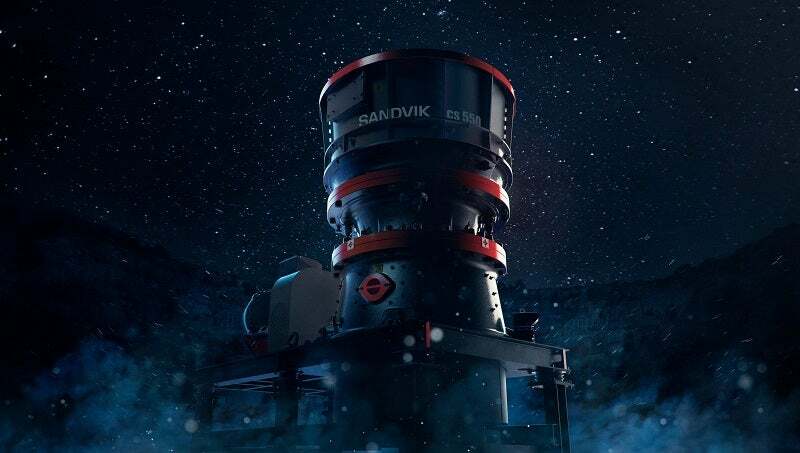 Sandvik Mining has expanded its CH800 series of mining cone crushers, launching two technologically advanced models that improve productivity and profitability in the mid-range segment. Sandvik DE130i and DE140i, the company's latest compact core exploration drills, feature more automation, increased productivity and easier operation, thanks to computer systems that control all drilling. Sandvik has unveiled its new +Range rock tools, featuring a unique steel alloy designed to extend service life and reduce rod changes while improving safety and slashing stock and handling costs. Sandvik LH204, a new 4t capacity LHD designed for narrow-vein underground mining applications, delivers class-leading safety and productivity in a cost-effective solution. Sandvik Mining has announced a new Pantera percussive drill platform designed specifically for mining and available for both down-the-hole (DTH) and top hammer (TH) applications, delivering increased drilling capacity, lower fuel consumption and improved safety. Sandvik Mining has announced the forthcoming release of its new DD422i development drill rig, the first of the company's Next Generation underground hard rock drill rigs. Sandvik Mining and Maptek Pty Ltd (Australia) have announced the execution of a memorandum of understanding (MoU) that will see the two leading mining suppliers cooperate to develop integrated planning, execution solutions and robust automation systems for the mining industry. Sandvik Mining will soon become the industry's first supplier to offer fully ROPS-compliant, acid-proof cabins for underground drilling. The cabins will be available on the company's forthcoming range of Next Generation underground rigs, starting with Sandvik DD422i development drill, which is due for release in mid 2014. A prototype of the world's newest underground hard rock mining haul truck has set new standards in productivity, safety and performance during full production trials at a gold mine in Western Australia. Sandvik Mining has launched its DD2710 single-boom electro-hydraulic jumbo, designed and manufactured in collaboration between the company's Finnish and Chinese operations for mining development in tunnels with cross sections up to 34m². It's no secret that the mining industry poses many potential risks to both people and the environment, and Sandvik Mining has launched a new environment, health and safety (EHS) campaign to underline the company's commitment to eliminating those risks. Pantera DI6400, the new down-the-hole (DTH) percussive drill platform from Sandvik Mining, has won over a 40 member expert jury to earn top honors in the 2014 Red Dot Award product design category. Sandvik has introduced a multifunctional N surface and underground (NSU) core barrel system; a first of its kind that features interchangeable components and offers standard and pump-in applications in a single system. Sandvik Mining has upgraded its Sandvik LH410 underground hard rock loader to improve operational flexibility and productivity. Lower ore grades and smaller discoveries call for equipment to reach deeper and more complicated ore bodies. Sandvik has responded to this need by releasing Sandvik DE151, one of the most powerful and compact underground exploration core drills on the market today. Sandvik Mining has announced the launch of the world's largest hydraulic top hammer rock drill, RD2045C, delivering increased drilling capacity, more efficient rock breaking, improved blast fragmentation and higher reliability. Sandvik Mining has introduced the new Sandvik DD211 underground hard rock mining development drill for narrow-vein applications, featuring safety upgrades and more automation for increased production. AutoMine® Surface Drilling, part of the Sandvik AutoMine expanded suite of automation products announced at MINExpo INTERNATIONAL 2012, applies the technology and experience used to develop the company's underground automated mining systems used successfully in hard rock operations around the world. Sandvik Mining has added 6in and 8in models to its growing RH460 DTH hammer family, designed to reduce costs, increase penetration rates and prolong service life in even more drilling applications. New Pantera is a robust and productive range of trackdrills designed with the environment, health and safety in mind. With a weight of more than 34t and a width of 3m, the all-new Pantera trackdrills are built to stand their ground. They're based on a modular design with down-the-hole (DTH) and top-hammer (TH) versions, for blast holes, pre-split and mine development in the four-to-eight-inch segment.